Note This is a video game console. With an add-on, the Intellivision Computer Module the Mattel Intellivision game console was turned it into a computer, the same way that the Coleco Expansion Module #3 turned the ColecoVision into a Coleco ADAM. The first is the computer module itself which plugged into the side expansion connector of the console. They added 2Kb RAM, 16Kb ROM, built-in BASIC, a cassette interface, a printer interface, and 3 additional sound channels. The second piece was it's detached 49-key chicklet keyboard which plugged into the two ports of the paddles. Power was provided seperate from that of the Intellivision by a wall-mounted transformer. This unit came in two colors: the off-white to match the case of the Intellivision II and brown to match the original Intellivision. The brown cased variant is much less common. 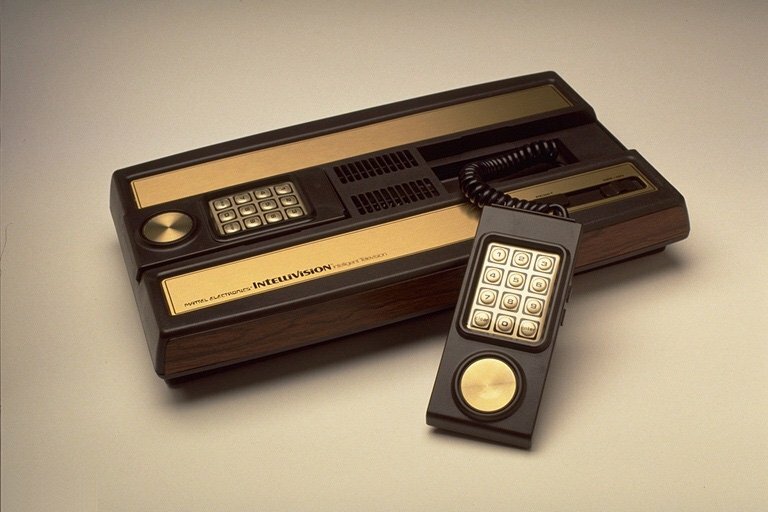 Prior to introducing this upgrade setup early in 1983, Mattel had promised a keyboard component to turn the Intellivision into a computer, but their cost had become prohibitive and the unit was only released in very small numbers (about 4000 units). Finally Mattel released the above system, also known as the Intellivision Entertainment Computer System though the box for it shows 'Intellivision Computer Module'. Configurations 2 paddle with numeric keypad included.